Kit lens is a lens that is sold in a package with the camera. Average lens we have a geeky look, his material may look frail with plastic material, and his specifications may not be able to make proud, but the kit lens is the perfect option for those who just started an interest in photography and wants to make peace with the budget. After we know the type of some camera lens in the previous post (read in here) in this article we have to explain about the advantages of kit lens camera. And this is 7 advantages of Kit Lens Camera which is often Underestimated. Although tampangnya geeky, a kit lens has a focal length of 4 classic, in other words a kit lens could replace the four lens prime/fixed at once. Four classic focal length above is: 28 mm (wide-angle), 35 mm (medium wide), 50 mm (normal) and 85 mm (portrait). The figure above is the focal length of numbers to a full frame camera, focal length equivalent to APSC cameras are respectively: 18 mm, 23 mm, 35 mm and 56mm. And this time the majority of the kit lens for the camera APSC sold has a range of 18 – 55 mm. Another option is kit lens with a range of widths up to approach the medium telephoto: 18 – 105 mm or 18 – 135 mm. Likewise, when you buy a full frame camera, kit lenses are most commonly on offer is 24 – 105 mm. Indeed the kit lens will not offer the most powerful openings, large numbers of f/3.5, but at least you get the four basic functions of the lens (or more) in a single lens kit. The most frequent kit lens sold bundled with a camera lens is the APSC 18 – 55 mm. Lens it does seem plain, but keep in mind that he's also very lightly and Petite. For example, the kit lens Canon 18 – 55 f/3.5 – 5.6 IS STM only weighs 200 grams and maximum length of only 6 cm. While similar lens specs semi pro, Canon 17 – 55 mm f/2.8 IS USM weighing 650 grams and maximum length 11 cm. Almost 2 times as long and three times heavier. Same for Nikon. The Nikon kit lens 18 – 55 mm f/3.5 – 5.6 has a weight of 195 grams and maximum length of 6 cm. Compare with Nikon 17 – 55 mm f/2.8 G DX does it weigh 755 grams and maximum length 11 cm. If anyone is running away or will travel tours, weights and measures this will really be grateful. Lens filters still useful, even though we live in the digital age. And for this law applies a filter: the greater the diameter of the filter more expensive price. The basic kit lens as we call on top has a small physical size, automatically requires a smaller filter size anyway. Kenko Pro – 1 Filter CPL (circular polarizer) useful to prune reflection when we photograph shiny surface (air, glass etc. ), measuring 77mm (pro) can cost above $100. Compare with the same filter for the kit lens (diameter of 58mm), it was not until $60. Minimum Focusing Disctance, most notably reviewed in this article is a measure of the ability of the lens to photograph the object distance is near. We do not hope to match the capabilities of the macro lens, but the kit lens is surprisingly have MFD is better compared to the more expensive lens. Both of the above lenses (18 – 55 mm f/3.5 – 5.6 Canon or Nikon owned both) have the ability to focus at close range better than lenses 17 – 55 mm f/2.8 which is much more expensive. There is an expression that means so much in photography (and other fields): when we are confused what to buy, it means we are not/not yet needed. When you've been using the kit lens in sufficient time period, you will simply know the ins and outs of photography. You also know the more personal taste in photography. When you know that your taste and passion is the photo of the landscape and you're "grown" beyond the capabilities of the lens kit, buy a special lens view: 10 – 22 mm or 12-24 mm. If you studied economics in school, more or less knew with economies of scale. Well, the kit lens can be sold very cheap because the manufacturers produce the kit lens in a very much so that production costs can be pressed and consequently the cost of making him cheap. All the stores selling the kit lens with a very cheap price as we bought it together with the camera. As an illustration, if we purchase the current Nikon D3200 + kit lens 18 – 55 mm, the total purchases of both is $500. But when we buy the D3200 Nikon camera (body only) it costs already $450. so the lens kits are "only" valued at $50. Whereas when buying 18 – 55 separately, this lens is priced at $160. The camera lens is an eye of the camera. Without the camera lens, the camera cannot be used. Camera lens sepertihalnya human eye. In the activities of photography, lens is also a vital tool in addition to the camera. The selection of lenses in photography is also very important. Let's discuss more about the ins and outs of the camera lens. A camera lens (also known as photographic lens or photographic objective) is an optical lens or assembly of lenses used in conjunction with a camera body and mechanism to make images of objects either on photographic film or on other media capable of storing an image chemically or electronically. There is no major difference in principle between a lens used for a still camera, a video camera, a telescope, a microscope, or other apparatus, but the detailed design and construction are different. A lens might be permanently fixed to a camera, or it might be interchangeable with lenses of different focal lengths, apertures, and other properties. Lens Manual KameraLensa manual cameras manual cameras were also used to (SLR). This versatile lens operation manual, from the beginning to determine the point of focus, to determine the diafragmanya. Most physical properties of manual lenses can be seen from his body made of steel and the obvious no buttons or swit replacement auto focus. In the current era, manual lenses can also be used on a digital camera, but had to modify the manual lens mount to be attached to a digital camera. This manual lens advantage is his strong body, and if it finds a fitting focal point then his results will be very sharp. Digital camera DigitalLensa camera lens used for a digital camera or camera DSLR (Digital Single Lens Reflect). The operation of this digital lenses can be manual or otomasis, because there is the button auto focusnya. But if you use the auto focus mode on, never rotate the ring its autofocus, because it will damage the digital lens. Features of digital camera lenses are typically made from a type of plastic, has the features autofocus and certainly used in digital cameras. Excellence on the lens is certainly on autofocusnya features in compare with manual lenses. The following are the types of lens according to their function and its focal length, can be used as a reference if PAL wants to buy a new lens. Don't get me wrong select Yes. Canon lens Fix 50mmLensa standard or normal cameras have focal length between 35 mm – 70 mm. The most common of the standard lens is a lens that has a focal length of 50 mm (such as lens canon 50 mm F1.8 Fix). Because the lens focal length of 50 mm, his gaze is equal to the human eye. Standard or normal lens usually used for documentation and street photography, where a photographer led to move quickly and take photos. The advantage of this camera lens is not too large and easy to carry everywhere. Camera lens 100 mm USMLensa CanonEF medium Telephoto has a focal length between 80mm – 135 mm. focal Range between 80-135 mm is almost always used by photographers to photograph portrait or model. because at the focal length not possible distortion. Camera lens fix on the type of medium telephoto camera lens this is the ideal camera for photographing portraits or model. Because as it says above the distortion will not happen. Canon lens EF 100 mm f/2.8 Macro USM is an example of one type of medium telephoto camera lenses. Lenses Canon EF 200 mm IS USM Telephoto camera f2LLensa has a focal length between 135 mm and 300 mm. Characteristic of this long lens, this lens has a range of a goodly distance. So the proper function in this camera is for photography sports or wildlife photography. Why telephoto lens photography is used for sports or wildlife photography? because it is not possible if we want to place sports a photographer an exercise such as motogp and we photograph should be closer to kelintasan? or if we want to photograph a lion in the jungle and we must draw near to the lion? One example of the lens of the telephoto Lens is the Canon EF 200 mm f/2 l IS USM. Lens AF-S NIKKOR 300 mm F2.8 G ED VR IILensa Super Telephoto cameras have focal length is more than 300 mm. Characteristic of this lens is long, and often required a tripod lens to prop up the front of the lens is too long. And keep in mind, the price of a super telephoto lens is also the panorama superrr sekale.. The function of the Super Telephoto Camera lens is the same as the lengsa camera telephoto photography, i.e. for sports and wildlife photography. Super telephoto camera lens used if a fotograer wants more from lens telephoto. One example of a super telephoto lens is a Lens AF-S NIKKOR 300 mm f/2.8 G ED VR II. Lens Tokina AT-X 116 Pro DX camera lensLensa Wide Angel has a focal length below 20 mm. As the name suggests, the wide angle camera lens features a wide capture power. This lens will produce image distortion. The function of the wide angle camera lens is to photograph the scene, photographing architecture, sometimes also used for photographing a group of people. We often hear the word Landscape Photography, landscape photography is well suited to use this type of wide angle lenses. One example of a wide angle lens is a Lens Tokina AT-X 116 Pro DX lens. Lenses Canon EF 8-15 mm f4L fisheye lens Fisheye Camera USMLensa is special. Fisheye camera lens usually has a focal length between/under 10 mm. fisheye Lens this will produce images that are unique, very distortion to a circular image that connects between the sides of the picture/photo. Because the lens is a fisheye camera lens specials, used specials-the specials too, her example if a fotografet want to show effek fisheye on a photo. One example of Fisheye Lens is the lens Canon EF 8-15 mm f/4 l fisheye USM. The lens type is often found there are 2 kinds. What is it? certainly often heard and maybe you have both types of lenses. Let's take a look. Camera zoom lens is a lens that can zoom, or lens has a focal length range, e.g. Canon lens EFS 18-mm IS, it is a zoom lens. Fix the camera lens is a lens whose focal length is already set, do not get on, so that zoom back and forth are photographers. Fix lenses tend to be sharper results than zoom lenses. (the same class). An example of lens fix lens is the Canon 50 mm f 1.8. A description of the camera lens above is a basic description should be in the know by photographers the camera jockeys. The selection of lenses that fit in every activity of the photography especially helpful and affect the end result of a photographic activities. 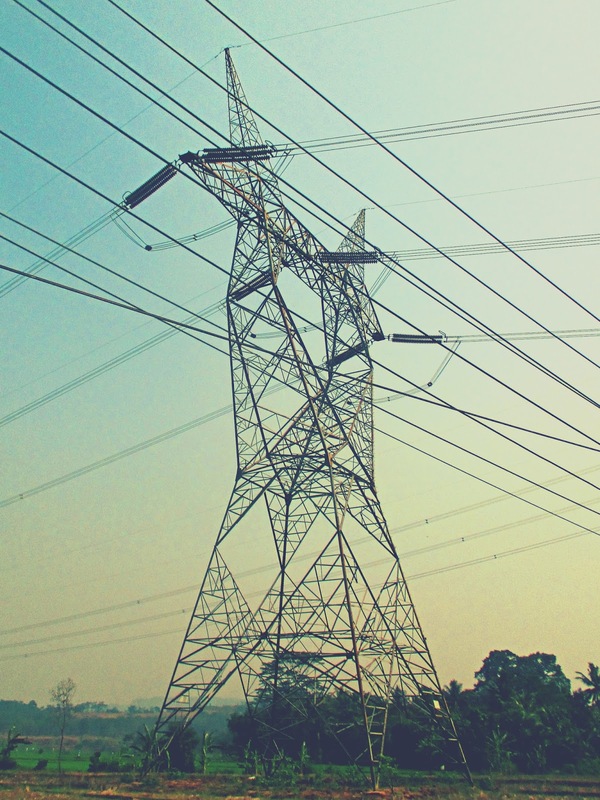 The building is located in Batang, this building serves as a pillar of power cables in Batang. SUTET stands for Extra High Voltage Air Channel with the power of 500 kV intended to distribute electrical energy from the centers of power plants located far toward the centers of the load so that electrical energy can be channeled efficiently. Various kinds of concerns would arise SUTET impact on the health of the people living in the area through which the high-voltage wires lines.